Christine, thank you very much for this recipe. This is one of my favorite. We did this every year when we were little. I wonder how I can do this "大深盤，放在另一小鍋暖水上面。盤底不要接觸水". Does this mean you sat a pan in a pot of warm/lukewarm water? But how come the bottom of the pan would not touch the water? Simply place water in a pot a bit smaller than your bowl. Fill an inch of water or so, then the bottom of your bowl won't touch the water. if i dun have 蒸籠, any other things can substitute it ? You can use baking tins or cup cake moulds. Even a rice bowl can do. Thank you very much for sharing. You are very knowledgeable in cooking so that we are not only learning the method but also understanding the reason. I have made some of the cakes you show us and this steam cake is the one I long to make for a long long time. I will make it this weekend. Thank you. Yes, you're right. It's partly because of using plain flour. If you use plain flour, the cake won't be as delicate and soft as it should be after steaming. Did you beat the eggs with sugar to very fluffy form with big volume? It's the key to making this cake successfully. 多謝您的食譜, 第一次做出來實了少少, 唔鬆軟, 問題應該是打旦和糖過了龍(打到旦漿不會跌下來, 好企身, 好似打cream咁), 和落麵粉時太長時間和大力. 結果, 第二次, 頗成功呀, 好開心, 跟捉指示, cheers. Hi Christine, my cake came out quite tough and dry, and I am sure I didn't beat the eggs long enough. Other than that, anything I should pay attention to? Thanks! There are two keys to making this cake successful. The first one you've known already. Beat the egg with sugar to a very soft and fluffy form. I think you'll make it after trying more. The second one is lightly folding in the flour. Don't stir too hard or too long. Otherwise the air inside would be knocked out. The cake would turn out flat and hard. Probably the bottom half of your cake was the flour that had sunk and sat on the bottom. The possible causes were the batter was not beaten enough, so it couldn't have enough support of the flour, or the flour were over-stirred. 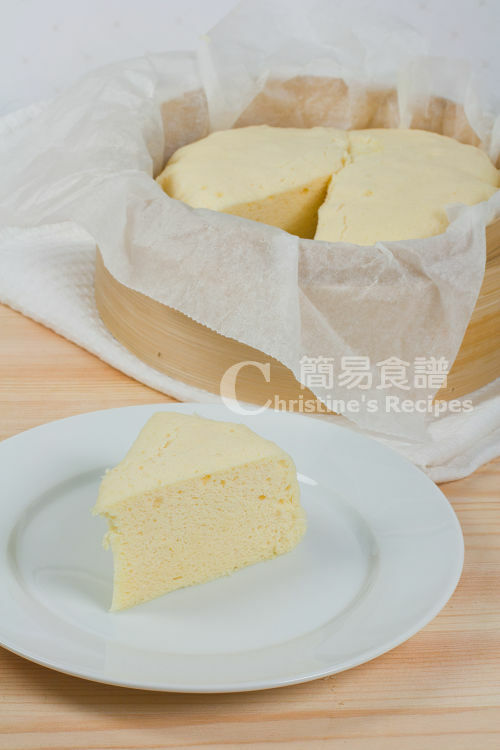 I first steamed a cake using other recipe however it was hard. Then I came to your blog for advice. And found that as u said, I didn't beat the egg stiff enough because the recipe I used just say "打至提起打蛋器時, 蛋漿會呈一直線流下來". Which is not the same as u said "等三秒才滴下一滴來". So I tried again using the same recipe however beat the eggs as your advice and successed finally!! I am so happy. Thank you very much again for your teaching. The step by step instruction plus your photos really are of great help when people like me struggled with cooking at times. Please keep up with your blog, many people learn a lot from you. Thanks. 1) 請問做這個 steamed Cake (西施蛋糕) 時, 蛋白和蛋黄是否需要分間打? 3 篩入 低筋麪粉後, 是不是要用手打蛋器拌勻, 不可用電動打蛋器? 4) 蛋是不是要分開打 (one at each time)? I appreciate your reply very much. 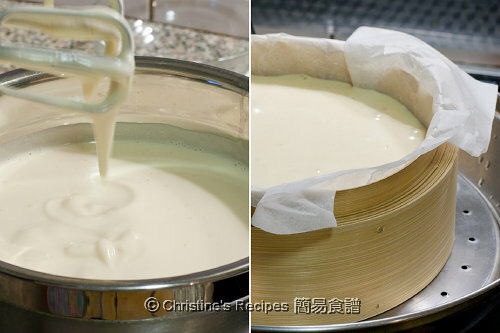 2)要不要落 cream of tartar or 泡打粉? I will make this cake for my son when he comes back for holiday. 我做了2次都失敗! 明明蒸的時候發得很好, 但一收火旦糕就即時下陷, 變得很實! 是否因為我加麵粉時攪拌太久呢? 因為我怕麵粉未拌勻, 所以用力快攪了一會, 是否這兒出錯呢? 請指教! Just clicked to your site. It looks so good. 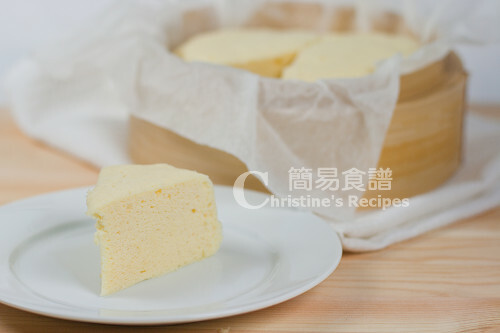 Hi Christine, I made the cake today, I use plain flour and corn flour 4:1 instead of low gluten flour. I steamed for 30 mins, it seems over cooked, it dropped a bit, still good but not as fluffy as the one thst my Mum msde.